I was personally excited to see Restaurant Week on this month’s calendar! Our family loves to enjoy everything that the Phoenix area has to offer, especially our award-winning restaurants! 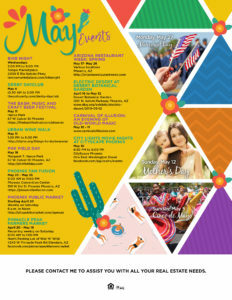 May in Phoenix offers truly something for everyone! Take a look at the Things to do in Arizona for May, it is a beautiful time to enjoy Arizona. I hope you enjoy this month’s edition of Things to do in Arizona. I can say with all sincerity we live in a desert paradise. I’d love to show you first hand. Get a hold of me if you are ready to buy or sell a home, there are some really beautiful homes available across the valley.